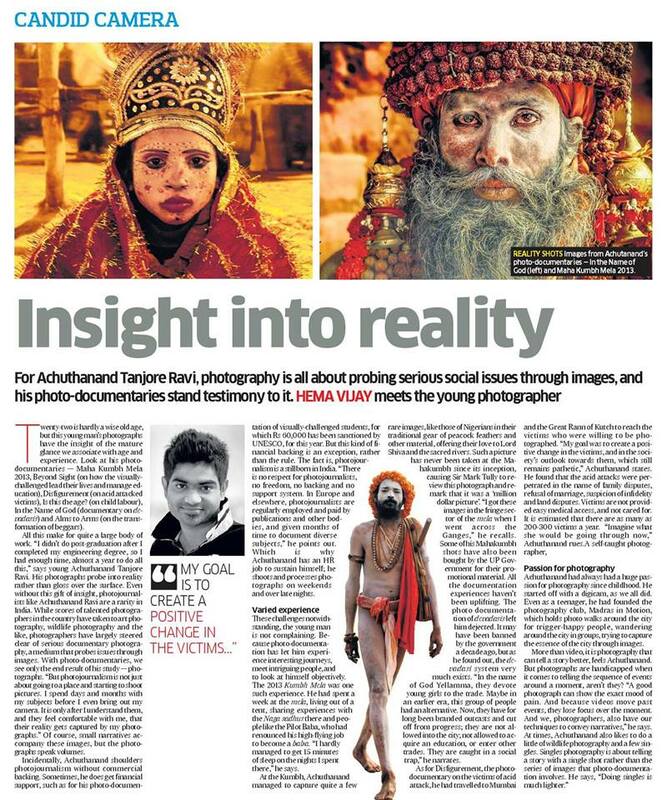 The Indian newspapers are giving a lot of coverage to photographers these days. The Hindu often has a full page photo essay on Sundays, and an article or two regularly. Indian Express and the Deccan Chronicle often showcase work in their daily and weekly inserts. It is important for documentary photographers to be recognized for their dedicated efforts to record the actuality of social issues challenging India and the unique traditions and communities which exist throughout the country and may disappear over time. What is often not mentioned is that to catch these striking images, photographers often must live hard for months, trekking kilometers carrying heavy equipment on rough terrain, risking physical injury from non-supportive members of communities, sleeping on dirt floors in remote villages for weeks where they have no contact with the outside world because networks don’t reach. Consider that those European photographers sent here to shoot may make 40,000 INR a day + expenses. An Indian photographer may get 16-24,000 INR if they are lucky, but many accept less to get work at all. This is despite the fact they often know the language and the terrain already where as the European probably requires a translator or fixer at an additional cost. So, a thank you must go to the press for supporting the work of those dedicated enough to spend their own time and money to create a record of the India many of us will never otherwise have the chance to see. And as individuals we must take the responsibility to slow down and look at those photographs that come through the internet or the press and find the message the photographer is presenting to us. We should think about what effort it took to catch that one image. And if one catches our eye, we must recognize the value of the work involved. Remember that when we buy one print, we are probably helping that artist get back out there and record something else that we would never see otherwise and should, as citizens of this Incredible India, be aware of. For a further look at the works of those Documentary Photographers presenting their messages through Pondy ART, check our website for direct links to their full portfolios.